28 m a s s a g e & b o d y w o r k j u l y / a u g u s t 2 0 1 8 SAVVY SELF-CARE best practices Conscious Breathing Letting Go and Inspiring Presence By Heath and Nicole Reed "Presencing" is the ability to bring our awareness into the here and now. 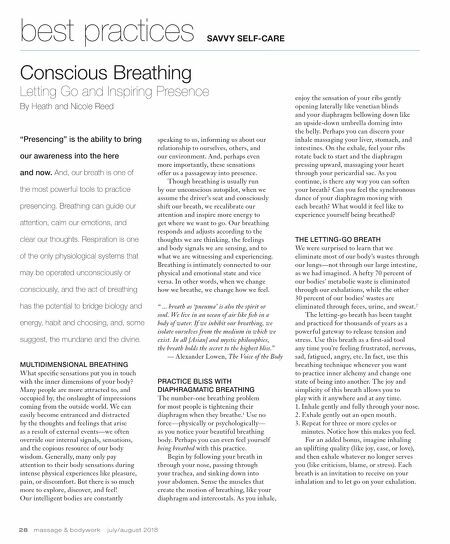 And, our breath is one of the most powerful tools to practice presencing. Breathing can guide our attention, calm our emotions, and clear our thoughts. 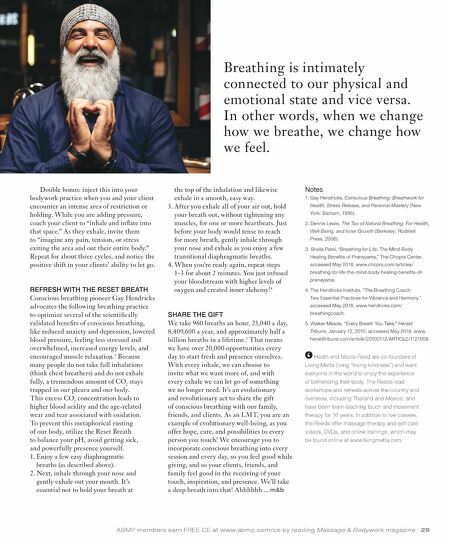 Respiration is one of the only physiological systems that may be operated unconsciously or consciously, and the act of breathing has the potential to bridge biology and energy, habit and choosing, and, some suggest, the mundane and the divine. MULTIDIMENSIONAL BREATHING What specific sensations put you in touch with the inner dimensions of your body? Many people are more attracted to, and occupied by, the onslaught of impressions coming from the outside world. We can easily become entranced and distracted by the thoughts and feelings that arise as a result of external events—we often override our internal signals, sensations, and the copious resource of our body wisdom. Generally, many only pay attention to their body sensations during intense physical experiences like pleasure, pain, or discomfort. But there is so much more to explore, discover, and feel! Our intelligent bodies are constantly speaking to us, informing us about our relationship to ourselves, others, and our environment. And, perhaps even more importantly, these sensations offer us a passageway into presence. Though breathing is usually run by our unconscious autopilot, when we assume the driver's seat and consciously shift our breath, we recalibrate our attention and inspire more energy to get where we want to go. Our breathing responds and adjusts according to the thoughts we are thinking, the feelings and body signals we are sensing, and to what we are witnessing and experiencing. Breathing is intimately connected to our physical and emotional state and vice versa. In other words, when we change how we breathe, we change how we feel. " ... breath as 'pneuma' is also the spirit or soul. We live in an ocean of air like fish in a body of water. If we inhibit our breathing, we isolate ourselves from the medium in which we exist. In all [Asian] and mystic philosophies, the breath holds the secret to the highest bliss." — Alexander Lowen, The Voice of the Body PRACTICE BLISS WITH DIAPHRAGMATIC BREATHING The number-one breathing problem for most people is tightening their diaphragm when they breathe. 1 Use no force—physically or psychologically— as you notice your beautiful breathing body. Perhaps you can even feel yourself being breathed with this practice. Begin by following your breath in through your nose, passing through your trachea, and sinking down into your abdomen. Sense the muscles that create the motion of breathing, like your diaphragm and intercostals. As you inhale, enjoy the sensation of your ribs gently opening laterally like venetian blinds and your diaphragm bellowing down like an upside-down umbrella doming into the belly. Perhaps you can discern your inhale massaging your liver, stomach, and intestines. On the exhale, feel your ribs rotate back to start and the diaphragm pressing upward, massaging your heart through your pericardial sac. As you continue, is there any way you can soften your breath? Can you feel the synchronous dance of your diaphragm moving with each breath? What would it feel like to experience yourself being breathed? THE LETTING-GO BREATH We were surprised to learn that we eliminate most of our body's wastes through our lungs—not through our large intestine, as we had imagined. A hefty 70 percent of our bodies' metabolic waste is eliminated through our exhalations, while the other 30 percent of our bodies' wastes are eliminated through feces, urine, and sweat. 2 The letting-go breath has been taught and practiced for thousands of years as a powerful gateway to release tension and stress. Use this breath as a first-aid tool any time you're feeling frustrated, nervous, sad, fatigued, angry, etc. In fact, use this breathing technique whenever you want to practice inner alchemy and change one state of being into another. The joy and simplicity of this breath allows you to play with it anywhere and at any time. 1. Inhale gently and fully through your nose. 2. Exhale gently out an open mouth. 3. Repeat for three or more cycles or minutes. Notice how this makes you feel. For an added bonus, imagine inhaling an uplifting quality (like joy, ease, or love), and then exhale whatever no longer serves you (like criticism, blame, or stress). Each breath is an invitation to receive on your inhalation and to let go on your exhalation.